You won’t find many overly specialized cookbooks in my collection. Entire volumes dedicated to one ingredient are inevitably packed with filler, or so many minor variations – inserted just to boost the recipe count – as to not matter. The greatest offender of this type is the chicken recipes cookbook, which I would invariably find on the meager cookbook shelf of many of my recently-graduated college friends. Realizing that they had to cook for themselves, and figuring – wrongly – that you couldn’t screw up a chicken, they would grasp onto books like this as culinary life preservers, but would ultimately be disappointed in the numbing sameness of the preparations. Now you can at least rely on Cook’s Illustrated to come up with their usual thoroughly-researched ultimate entry in the category.
. Shortly after a friend at Publishers Weekly who gets free cookbooks (I’d hate her if she didn’t pass the occasional book on to me) had posted about her success cooking the Greek Roast Chicken with Caper Butter, Roast Lemons and Skordalia, I saw that the book was the newest “Cook the Book” entry at Serious Eats. 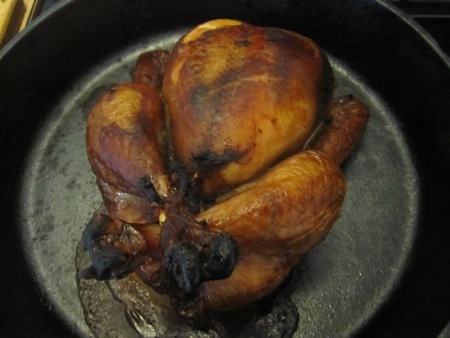 I tried the Roast Chicken in Porchettata recipe, then added a comment to the “What’s your favorite way to roast a chicken?” thread. 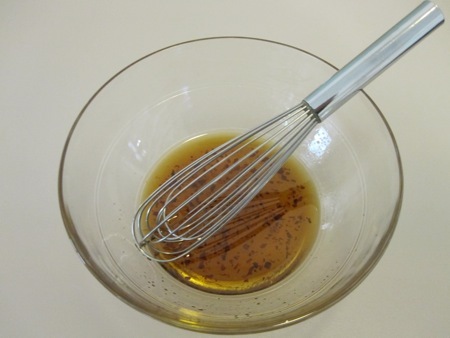 No surprise there, it’s the method Thomas Keller uses, demonstrated in this post. My comment also doubled as an entry in a giveaway of five copies of the book, and, much to my surprise, I won. My prize arrived last week, and after a quick read-through (It’s divided into sections: roasting, sides, salads, soups, pasta & rice, and brunch, lunch, & dinner.) 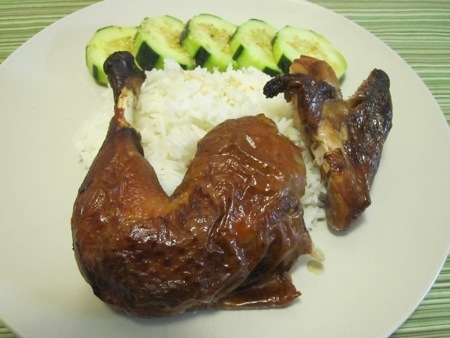 I settled on this – Tea-Brined Five-Spice Roast Chicken with Spicy Sesame Cucumbers – as the inaugural recipe. The recipe calls for a whole four-pound chicken. I only had a three-pounder on hand, so I supplemented it with a two-pound bone-in chicken breast. I assembled the brine components: a dozen Lapsang Souchong teabags, an orange (zest removed), a half cup of kosher salt, a quarter cup of dark brown sugar, five whole cloves, two star anise pods, three slices of fresh ginger, a teaspoon of black peppercorns, two whole cinnamon sticks, and a teaspoon of fennel seeds. I brought eight cups of water to a boil, removed the pot from the heat, added the zest, tea, spices, and ginger, and let the mixture steep for twenty minutes. 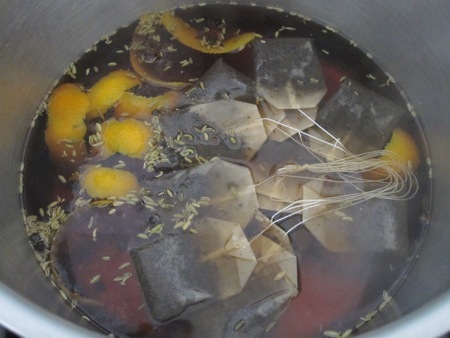 After removing the teabags, I added the salt, sugar, and the juice from the orange, stirring until everything dissolved. I put the chicken in a large zip-top bag, added the brine, squeezed the air out of the bag, and let it sit in the fridge for 24 hours. I removed the chicken, dried it, placed it on a rack over a sheet pan, and returned it to the fridge for another 24 hours. I put a cast iron skillet in a 450°F oven and let it heat up for ten minutes. 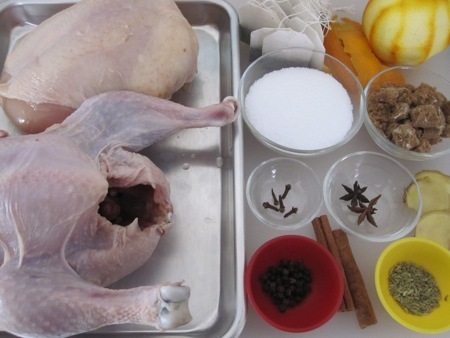 Although every photo in the book shows a bird with the legs tied, the recipes don’t specifically require that step. 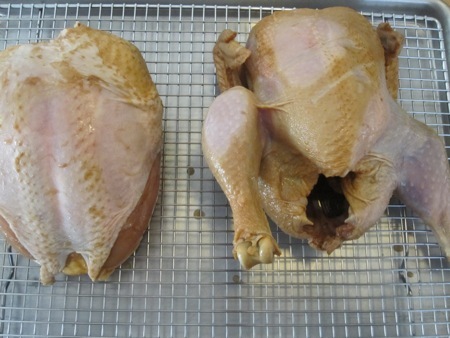 But, having gotten into the habit thanks to Chef Keller, I removed the wishbone and trussed the whole chicken. I roasted it in the skillet for about an hour, flipping it over at the 20-minute mark, and then again at 40 minutes. The breast roasted in a baking dish for 40 minutes. While the chicken rested, I prepared the cucumbers. I used one whole cucumber, a quarter cup of toasted sesame oil, a tablespoon of sesame seeds, a quarter teaspoon of red pepper flakes, a quarter teaspoon of salt, and a pinch of sugar. I mixed the oil, salt, sugar, and pepper together in a large bowl. 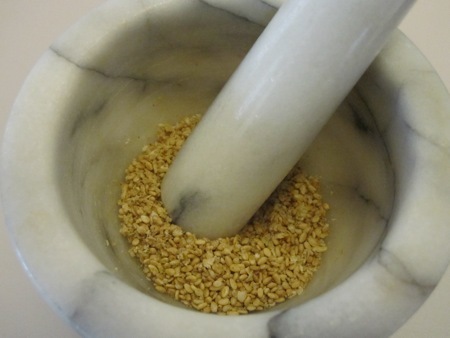 I toasted the sesame seeds over low heat until they turned light golden brown, then crushed them in a mortar and pestle after they cooled. 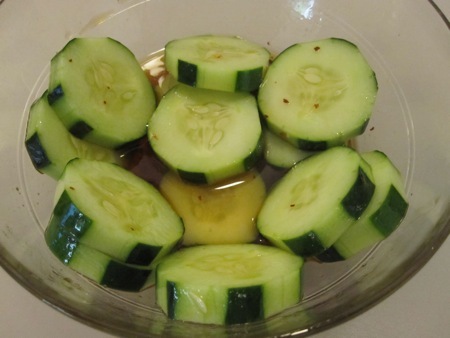 I peeled strips off the cucumber, cut it into quarter-inch thick rounds, and let them soak in the oil mixture. I served the chicken over steamed jasmine rice, garnished with the cucumbers, and sprinkled the sesame seeds over the slices. The chicken was definitely worth the two-day wait. It had the proper balance, tasting primarily of five spice, with background notes of smoke and citrus. The cucumbers added cool crunch and a bit of heat. Although the recipe is streamlined for home kitchens, I’d consider using this technique with the stronger flavors of a whole duck. And what about the other chicken breast? I have plans for that beauty, the subject of a future post.